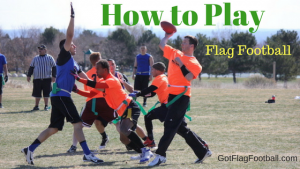 Find the best flag football adult leagues, pickup games and tournaments in the state of Colorado. 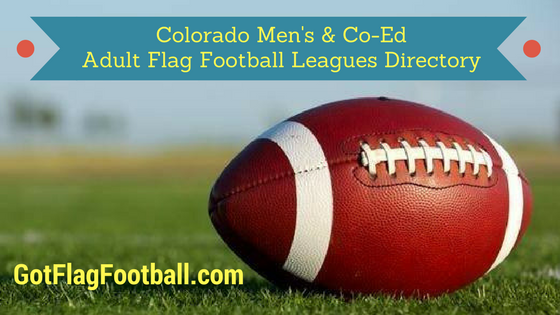 Below you’ll find the top up-to-date for 2019 list of fall, winter, spring and summer, indoor and outdoor local flag football leagues, pickup games and organizations that offer tournaments, organized from the highest to least populated cities and towns in CO.
GotFlagFootball.com brings together the recreational and competitive local flag football Colorado community of organized leagues, city recreational leagues and pickups in one list (in alphabetical order), so that it’s easy to find a game near you. CityWide Sports offers both men 5v5 and women 5v5 divisions. The season is 7 games long, all of which are played on Mondays. Seasons are offered in the summer, as well as other times throughout the year. Play Mile High offers men’s 5v5 and coed 8v8 teams and league seasons are 7-8 weeks with playoffs. All equipment is provided and players enjoy additional perks throughout, including a free beer party after the season ends. Known as Colorado’s most competitive flag football league. Premier offers 8v8 teams with contact allowed at the line of scrimmage. Awards are offered for the 1st place team in the form of a trophy and cash prize. The cash prize is based on the number of teams entered, which often adds up to well over a grand. This league is a parks and rec service, which offers 8v8 men’s flag football. Adult league with 4v4 teams on the field, however, team can have as many players on the roster as desired. The season is 8 weeks long and games are played indoors, primarily on Friday evenings or occasionally on Tuesday evenings. Check the website for league entry fees. The Edge Sports Center offers adult Indoor flag football leagues in the Fall and Spring with 8v8 teams. The format is similar to high school football rules. This league has a 60-yard by 40-yard indoor field, which is claimed to be the largest in Northern Colorado. The field is also composed of the latest generation of in-filled synthetic turf that mimics real grass. Apex offers a men’s open division 8v8 at Ralston Park and all games are played on Sundays. There is a 7-game guarantee + playoffs for the top 4 teams. Apex Adult Flag Football Leagues are governed by NFHS rules. The city parks and recreation department offers multiple adult leagues annually, including indoor flag football. Boulder, CO Flag Football is an adult flag football pickup group consisting of over 600 Meetup members. This is a recreational pickup group that meets weekly, as it has since 2012. BCFF has organized several competitive teams that have won championships in various city leagues throughout the Denver-metro area, including Littleton and Longmont. Currently, they host weekly games at Centennial Middle School Track. The City of Longmont parks and rec department offers competitive and recreational Leagues, offered in Men’s 8v8 on Tuesday nights. Each team plays 8 games at Sandstone Ranch on an outdoor field. Premier Flag Football Federation extended its presence to the northern part of the Denver-metro area and settled in Loveland. The most competitive flag football league in the state offers 8v8 contact leagues, multiple seasons throughout the year. They host B-comp and A-comp leagues, which are both high caliber. A number of awards and cash prizes are granted to the league winning team. Foothills Parks and Recreation offers men’s 8v8 indoor and outdoor leagues, in the fall, winter, spring and summer season. Competitive games with dozens of teams are played throughout the year. Teams must provide their own uniforms and flags. The outdoor league fee is slightly less expensive than the indoor. Indoor games are typically played Wednesday and Thursday evenings, whereas outdoor games are commonly played on Sunday mornings. This pickup group offers semi-competitive play, open to any skill level. Games are similar to league style flag football without the registration cost. The group game time and location has changed over time, but typically meets on Saturday or Sunday mornings. The parks and recreational department of the Town of Erie, CO offers multiple adult sports leagues throughout the year. If you don’t have a team to enter into the league, there is opportunity to play through the free agent list.